The St. Tammany Parish Sheriff’s Office today (Jan. 16) released the 2018 crime statistics for unincorporated St. Tammany, showing a continued decrease in crime and a continued above average solve rate. Crime is down in unincorporated St. Tammany, including homicides. In early 2018, Sheriff Randy Smith reported crime stats for 2017, which included 17 homicides. This was the first year since 2007 for the parish to see a homicide rate in the double digits. For 2018, that figure dropped to five*, supporting Sheriff Smith’s opinion that the homicide rate of 2017 was an anomaly. Of the five homicide cases the St. Tammany Parish Sheriff’s Office worked in 2018, one occurred in the jurisdiction of the Village of Folsom/Folsom Police Department. At the request of the Folsom Police Department, the STPSO worked that case. The other four cases include a double homicide of two individuals that occurred in the Pearl River area in February, the murder of a man that took place on a West Pearl River sandbar in June, the shooting death of a hunter that happened in November in the Honey Island Swamp, and a justifiable homicide following a St. Tammany Sheriff’s deputy being shot in the line of duty on Easter morning. All five of these homicide cases have been closed and cleared by arrest or solved. 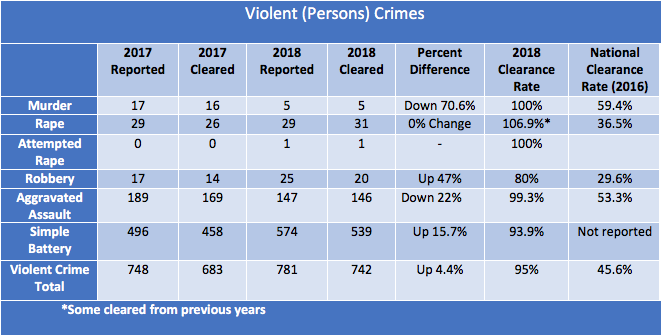 Non-violent crime in unincorporated St. Tammany is down nearly 19% from last year after a slight increase in 2017. This category includes burglaries, thefts and auto thefts. Reported burglaries, which includes residential and business burglaries, are down from 412 in 2017 to 262 in 2018. Thefts, which includes thefts from vehicles, are down from 1264 in 2017 to 1078 in 2018, a 14.7% decrease. Sheriff Smith hopes that this number continues to decline as part of his continued commitment to educate residents on the need to remove valuables and lock their vehicles. The solve rate in St. Tammany Parish for non-violent crimes (44%) also remains more than twice that of the national average (18.3%)**. “Keeping crime rates down demonstrates the partnership between our agency and the community we serve. Thanks to the hard work of our deputies and our detectives to keep our clearance rates high, the St. Tammany Parish Sheriff’s Office continues to send the message that crime will not be tolerated in our community and criminals will be arrested,” says Sheriff Randy Smith. Sheriff Smith asks that anyone with information about crimes occurring in our parish, to submit a tip through the St. Tammany Parish Sheriff’s Office website (www.STPSO.com), by calling the narcotics tip line (1-888-GO-2-JAIL), or by calling Crimestoppers. You can remain anonymous and may be eligible for a cash reward through Crimestoppers. **National averages are based on last available 2016 numbers. *The actual murder numbers for UCR reporting to the FBI for 2018 will reflect an additional four from the previous year.